My baby used to love playing at “The Farm”, swatting at Mirror Cow and kicking Jingle Pig, until one day, almost all of the sudden, she was more likely to crawl away from “The Farm” than to spend even a few minutes exploring its all-too-familiar sights and sounds. At six months old, she was over her fascination with her farm-themed activity gym, and she needed new toys that would stimulate her senses, build her reasoning abilities, help develop her motor skills, and keep her (relatively) occupied. Let’s be honest: I was starting to get a little bored myself. I knew buying a few new toys was a good idea. 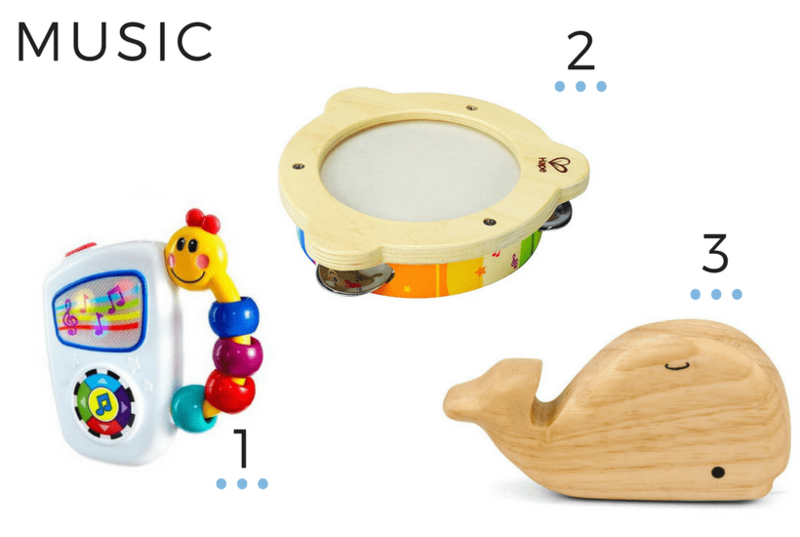 Now I have tons of time-tested toy recommendations that are perfect for babies and toddlers! 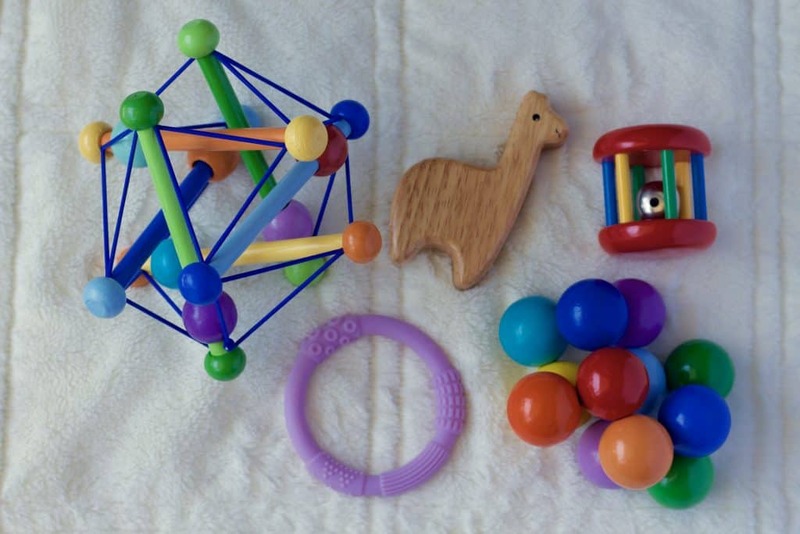 I’ve divided my toy recommendations into several categories: Sensory, Teethers, Clutching, Rattles, Stacking, Music, Balls, Books, and Activity Center. When you select one toy from each category, your baby will have a nice variety of toys that will encourage healthy development. I have personally used these toys across several months, and recommend them after many happy hours of baby play. 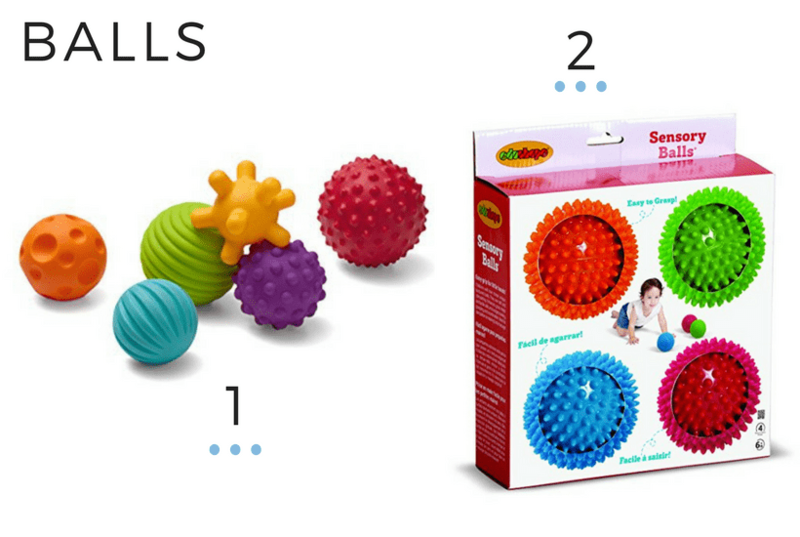 These interactive toys often feature different textures, sounds, and colors to stimulate the senses. These are great transitional toys! My baby liked to pull on the tags and I used it to introduce her to colors. I liked to name the color of each tag as she pulled it. I’ve spent a lot of time getting to know Freddy! 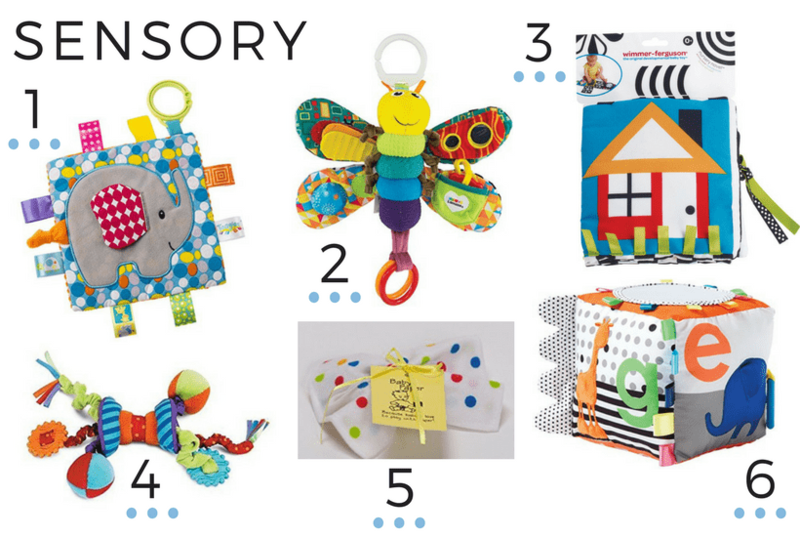 You’ll find Freddie on many lists of the top infant toys because he has a lot going on: bright colors, lots of textures, a few different sounds. A favorite toy at Grandma’s house, this one offers many different textures for babies to explore. An extremely simple toy that makes a satisfying crinkle. I liked this one for the diaper bag and car rides. It’s fun to toss this cube around and to talk about the pictures on each side. Don’t miss Misty’s post for more interactive toys for toddlers! When my baby started gnawing on board books, I offered her teethers to help manage the discomfort. (Sometimes I’m still offering her teethers. I offered her a teether today!) 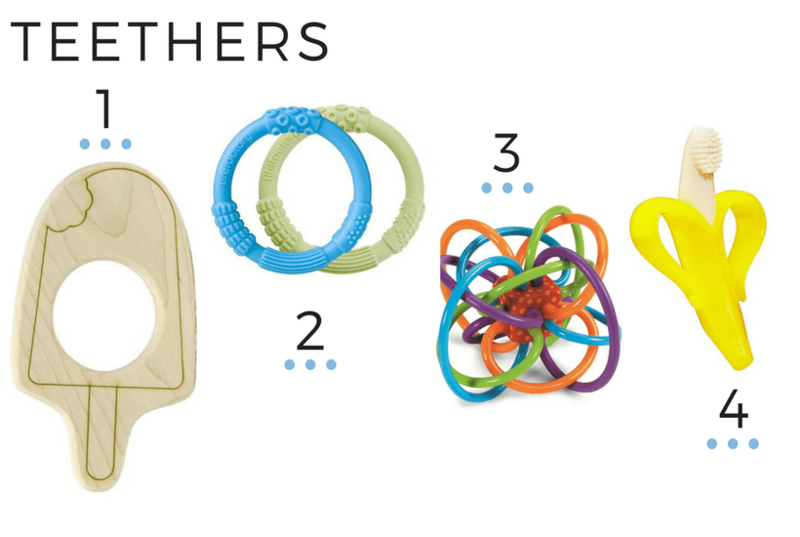 Teethers come in a huge variety of styles and materials, so there’s something for everyone. Little Sapling Toys makes several clever wooden teethers. I thought this popsicle teether was perfect for summer! These are hands-down my favorite teethers. We own FOUR! Though it makes a sound, I’m tempted to classify it as a ball. I don’t love it as an actual toothbrush, but this is a novel (and extremely popular teether). 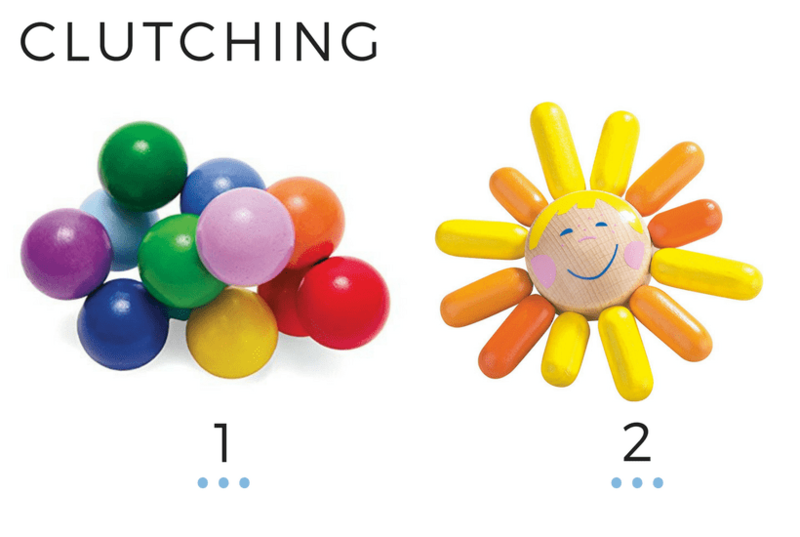 Clutching toys help baby practice grasping. These toys will be easy for baby to pick up and engage them with bright colors and moveable pieces. This is a beautiful wooden toy and my toddler is still fascinated by it. We call this one “Mr. Golden Sun” and I often sing the aforementioned song while spinning it around like The Wheel of Fortune. A classic baby gift! I prefer soft rattles for babies under 6 months, but once they’re sitting up and have better arm control, I’m comfortable introducing wooden or plastic rattles. I remember this classic toy from my childhood. I loved showing my baby how to stack blocks and then knocking them over to her delight. Blocks and stacking cups have longevity. My toddler still pulls these toys out on a regular basis. Modern wooden alphabet blocks that will instantly elevate your Instagram feed. Plus, Little Sapling Toys plants a tree for every toy sold. We play with these colorful blocks almost every day. In the beginning it was all about stacking, but now my child likes to look at the numbers and pictures on the blocks. These are fun for the tub but we play with them outside the tub too! Cultivate early music appreciation! It’s fun to create a kid-friendly playlist and encourage them to play along with these simple first instruments. I was honestly afraid to leave the house without this toy! My child’s first musical instrument, which she enjoys hitting like a drum. This shaker is super adorable. There are several different animals available. 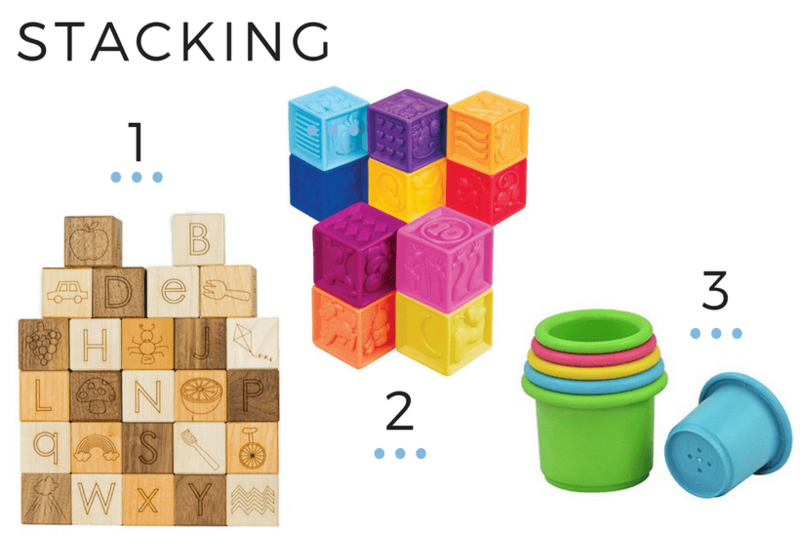 If you’re looking for even more ideas, read Amanda’s post about entertaining toys for baby. An open-ended toy with lots of possibilities. These balls have different shapes, sizes, and textures. We toss them in the air and roll the back and forth, but also talk about their colors and line them up by size. Great indoor/outdoor toys! Smaller scale balls in lots of fun shapes and textures. Larger balls that are more fun to toss, throw, and pass. Can you ever have too many books? I read board books to my baby from the beginning, but I loved introducing touch and feel books around six months. These are just a few of our favorites. This is part of a whole series by Jellycat. If you want to be extra fancy, you can buy the matching Jellycat animal. You’ll find many different textures and breeds in this book. Babies love dogs! Maybe the most classic touch and feel book you can find, with simple retro illustrations. The finger puppet makes this book delightfully interactive. 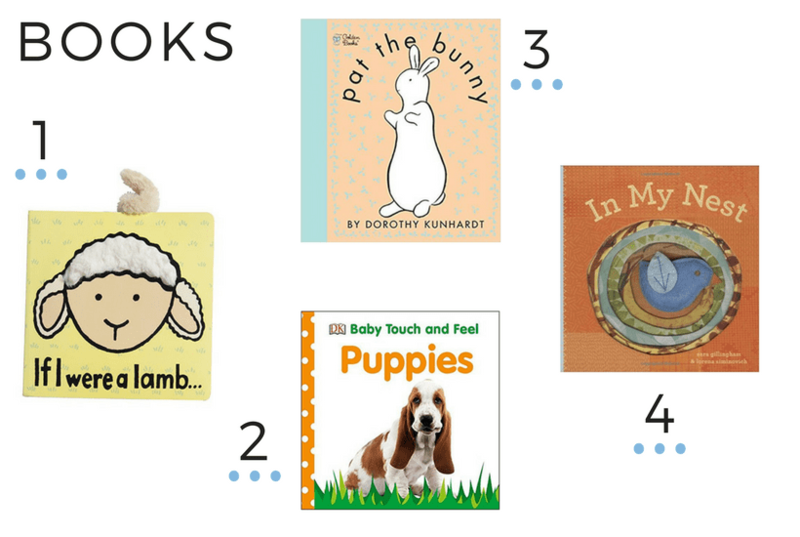 Check out Rebekah’s post for more books for babies and toddlers that parents will love! This activity center provided lots of baby play while I prepared simple meals. If you buy this toy you’ll get more done around the house, period. Your baby will have such a blast spinning the owl and playing peekaboo with the squirrel . Worth every penny. 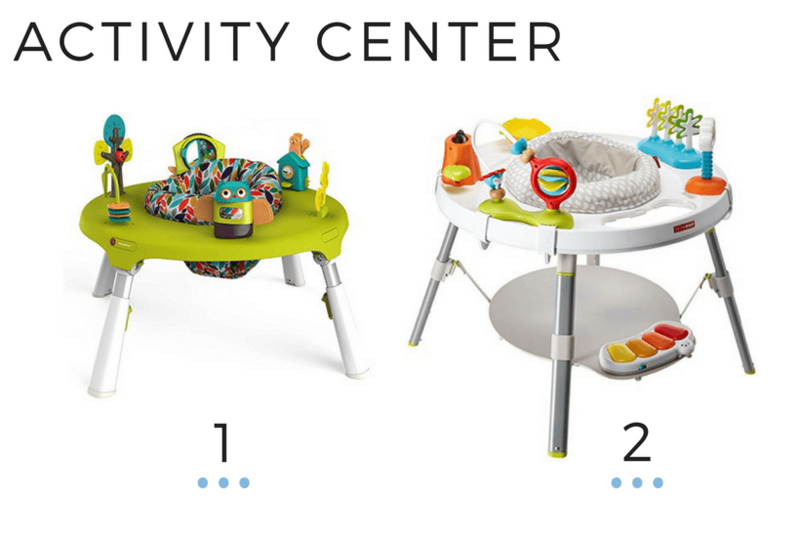 I have seen this activity center on display at a couple of baby boutiques, and it’s pretty darling. Plus, I trust Skip Hop. We’re still stacking colorful blocks, shaking the tambourine, and gnawing on our favorite teethers. Though I put “The Farm” away long ago, Jingle Pig and Mirror Cow escaped. They too must have been a little bored. They found a new home in the toy bin, mixed in with all the shiny new things. 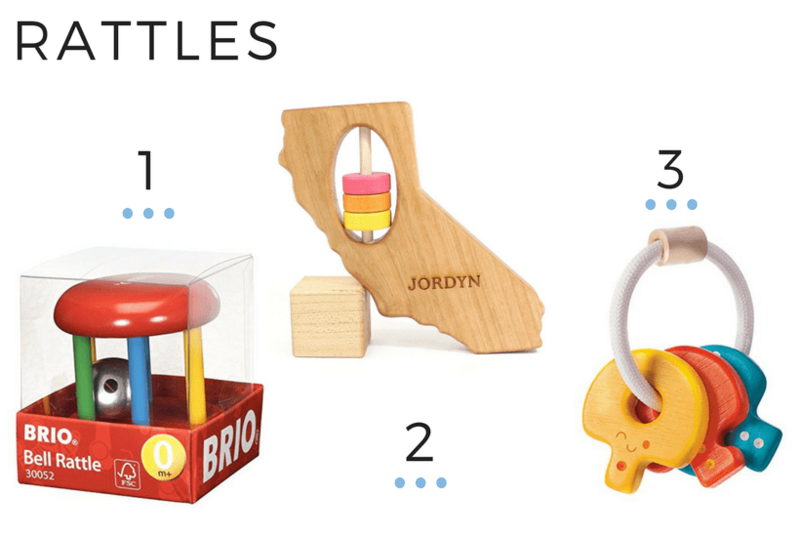 Don’t miss my other posts on the best baby toys, including my favorite toys for newborns and this list of stylish black and white toys. Is the whale shaped shaker the same as the llama at the top? I love that llama! I love these selections! We have a 9 month old and totally agree!!! Great choices. Great toy suggestions. My son loved the activity center too, I’m so glad I got it. We have several handmade drums my husband has that our son is starting to have a lot of fun with. It’s such a fun and exciting age! You know what’s crazy, I could never get my kids to enjoy the sensory toys, but the tethers they loved. It all depends on the child. I love how you categorized them for easy understanding. It’s also fun to see when the kids repurpose the toys as they grow. Our stacking cups are now our splash toy for the bath. Great post. So true that it all depends on the child! If one toy doesn’t work, another probably will. We needed it for car rides in those first few months too! Love the ideas. I have an almost 10 month old and wasn’t sure what toys are actually best for her. I’ll be checking some of these out. I’ve never seen most of these toys! Somehow we always forget to buy toys for this stage. I’m glad I could introduce you to some new ones! These toys look so cool! I especially love the California one!! Will check all of these out when I have another baby to buy for! Baby toys have changed a lot since the 90s early 2000s. It seems like there is a lot more to think about now. I really love the clutching toys you listed, never seen anything like those before. I agree that the toys are quite different! I babysat a lot in the 1990s and 2000s, and while some classics have always been around, a lot seems new to me too. This is a great list!! I love the wooden toys and shakers! They ar so cute and super durable! We buy wood toys whenever we can! Great list. We had a lot of these when my kids were that age! Those popcicle teethers are the best! I still get a kick out of that popsicle teether. “Food” teethers in general, really! These are great ideas! My daughter loves music so her little radio is usually close by. She also has a little phone that plays music that she holds up to her ear like mom and dad. I love watching her bounce up and down to the music! My little one loves music too! I love the California rattle!!! It’s fun seeing what toys we used and which ones to bookmark for the future! I know, I love the state rattle too! Bannor Toys is an awesome small toy company. There are some really nice toys here. My kid is much older now, but some of my friends are now having their first bundles of joy. I’ll be keeping these in mind for gifts for their little ones! My cousin is just about to have a baby so I’ve been stocking up on gifts. I’ll be sure to add some of these to the collection! How fun to stock up for your cousin! Great list of toys!! I don’t have babies yet, but I’m sure this list will come in handy some day. I’m not a momma yet, but this is a great round-up. I’m passing onto my sister who has a 6 month old! Love the teethers you picked out! I’ve never seen most of these toys but I thoroughly enjoyed reading your suggestions. I’ll be passing your url along to my daughter for my grandchildren. My granddaughter is more into the electronic toys at age 2 but my grandson is only 2 months so I’m sure she will be looking to add to their toy collection soon. I hope your daughter finds a few fun options for your grandson! I love it, they are definitely different than the other toys they usually have, but when I see these I’m interested like I want to play with them as well. I’m going to have to look into these toys for my son. This is such a helpful list! My little one is only six weeks old, and he’s just getting into his activity gym. But having this list will be great as he gets a little older, and we may also use it for some Christmas gift inspiration! We definitely loved our activity gym (aka: “The Farm”)! This is such a great list and so detailed! My daughters loved the banana teether 🙂 I am going to have to refer back to this list for gift ideas! The banana teether is so funny, and yes, babies seem to love them! Thanks Sarah! These are awesome suggestions! My almost 7 month old loves the banana toothbrush/teether, the Winkle toy, and the take along tunes! Fun to hear we have some of the same favorites!